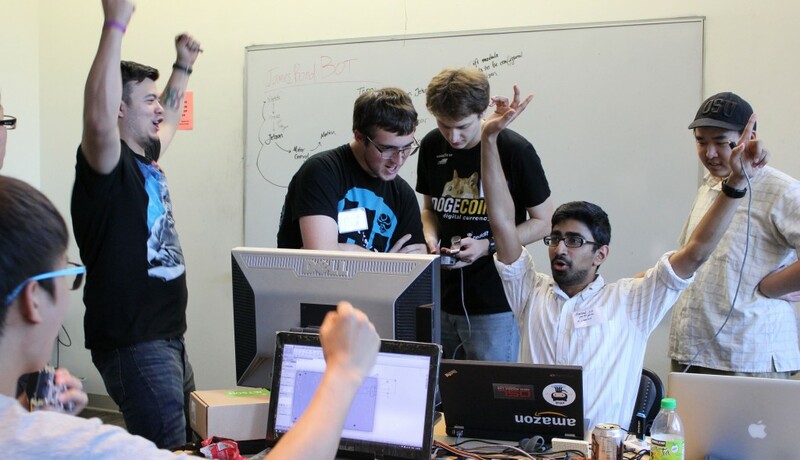 The Q-bot team celebrates a success during HWeekend. 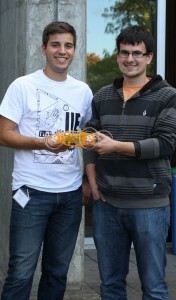 Projects like a prosthetic hand and a spinning LED display were completed in just 30 hours at Oregon State University’s second hardware weekend (HWeekend) on October 18-19. It was a feat that amazed everyone involved including representatives from the sponsoring company, Rockwell Collins. 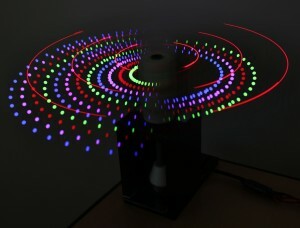 OSU students in computer science, mechanical and electrical engineering teamed up to create a spinning LED display. “I’m really impressed with the energy level and enthusiasm and the challenges that they took on. They were pretty big scope projects, and it was amazing what they got done in 30 hours,” said Bob Woods, director of engineering at Rockwell Collins, Heads-up Guidance System. Instructor, Don Heer, came up with the idea of a hardware weekend based on start-up weekends that focus on software projects. Heer wanted something that would incorporate all branches of engineering to give students an opportunity to have the experience of developing a prototype device under time pressure while working in diverse teams. That appealed to computer science student, Vedanth Narayanan, who was used to working on software development projects with other like-minded computer science students, but wanted to see what it was like to try and communicate across the different engineering disciplines. After 30 hours of work with no sleep, he was still gushing about the experience. “It’s awesome to see it all come together knowing that it wasn’t just one group that did it. It was multiple different disciplines that came together,” he said. Aaron Sprunger and Sean McGlothlin worked together to lead the largest team at HWeekend. Narayanan was part of the largest team of eight students who are majors in electrical, mechanical, manufacturing and industrial engineering in addition to computer science. Sean McGlothlin, a senior in computer science, came up with the idea for the project — an R/C car controlled by an Android app. It could have been an unwieldy number of students to work successfully, but they split into two main groups — mechanical and software — and had a designated leader for each. The team included Aaron Sprunger, a fifth year senior from industrial engineering with vast leadership experience who led the mechanical side. McGlothlin led the software team and the project design for the entire project. “It was a great privilege to have my idea — something that was just a concept in my head — worked on by a team of very intelligent people, and in less than two days I was able to hold that concept in my hands. I’m really proud of our team,” McGlothlin said. McGlothlin said the real value of the weekend was the chance to develop skills in project management and embedded programming. “I feel like I learned more in two days than I’ve learned in an entire term for some classes,” he said. The two awards (Executioners and Helping Hands) both went to the team who built a force feedback prosthetic hand. The team hit all their goals including a sensor suite to give the user both tactile and visual feedback. For example, an LED would turn from green to red in the presence of heat. Team leader, Karl Payne overcame a major glitch when the 3D printer quit printing before the hand was complete. So, with 4 hours to go in the competition he laser cut the rest of the hand, pinning and gluing it into place. The team was also renowned for helping out the other teams, in particular Simon McFarlane was named as a stand-out contributor across the teams. Brenden Hatton and Fangyi Zhu work on a prosthetic hand. If there had been an award for humor it would have gone to the Q-bot team whose presentation of their ambitious project of a spy robot had everyone laughing. “It is very proficient in sneaking around corners and going completely astray in its direction and delivering a .2 frames per second video feed which is utterly out of color sync,” quipped Aravind Parasurama. Throughout the competition representatives from Rockwell Collins were on hand to provide mentorship. Evan Marshall, an Oregon State alumnus and software engineer at Rockwell Collins admits to at first feeling obligated to come help out his alma matter, and was surprised at how much he enjoyed the experience, even sticking it out through the whole night. “Seeing the impossible happen — that was fun. The people who were here brought all their own energy and that was contagious,” he said. He was impressed with the expertise of the students who knew more about their specialized area than he did, so he mostly helped facilitate discussions and motivate the students by letting them know from an outside perspective they were doing great things. The sponsorship of Rockwell Collins made the entire weekend, including meals, free to the students. Heer was pleased with the success of weekend, which he plans to hold twice a year, the next one in January of 2015. “I’m always amazed at the quality of our students and how, given the slightest opportunity, they will go the extra mile to do something innovative,” Heer said. Bit Car: An R/C car controlled by an Android app that was connected via Bluetooth. Kathleen Gladson, Joshua Grosserhode, Emmanuel Lopez-Aparicio, Sean McGlothlin, Vedanth Narayanan, Aaron Sprunger, Zachary Stark and Kyler Stole. 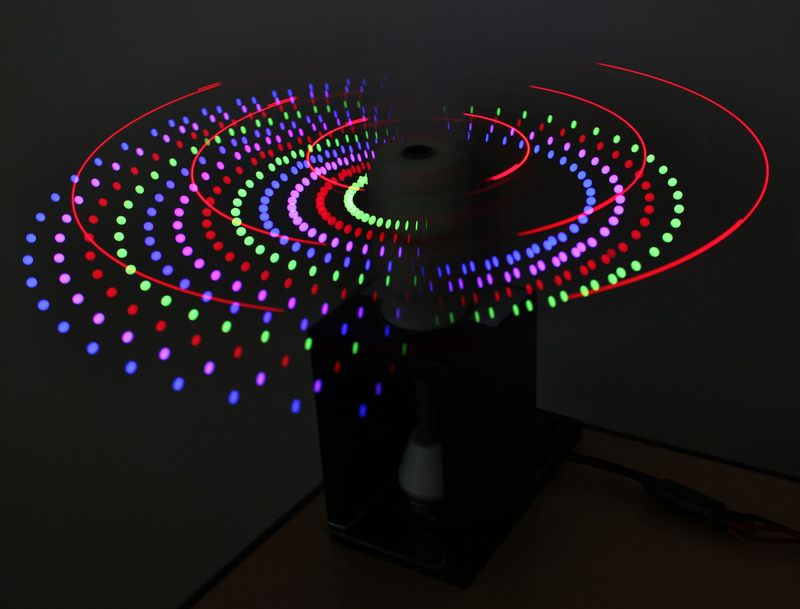 The Great Light Hype: A prototype for spinning volumetric display that could eventually render virtual objects mapped via localization to physical coordinates in a room. Kyle Cesare, Ryan Skeele, Jake Yazici and Soo-Hyun Yoo. The Thing, Prosthetic Hand: A prosthetic hand that incorporated sensors and feedback, such as a pressure sensor that would trigger a vibration to indicate gripping force. Brenden Hatton, Judy Jiang, Scott Merrill, Simon McFarlane, Karl Payne and Fangyi Zhu. Q-Bot: A voice controlled robot with an omnidirectional camera that streamed video to a smartphone or a tablet. Tyler Gilbert, James Harris, Keaton Scheible, Alwin Sudhana, Sorawis Nilparuk and Aravind Parasurama.